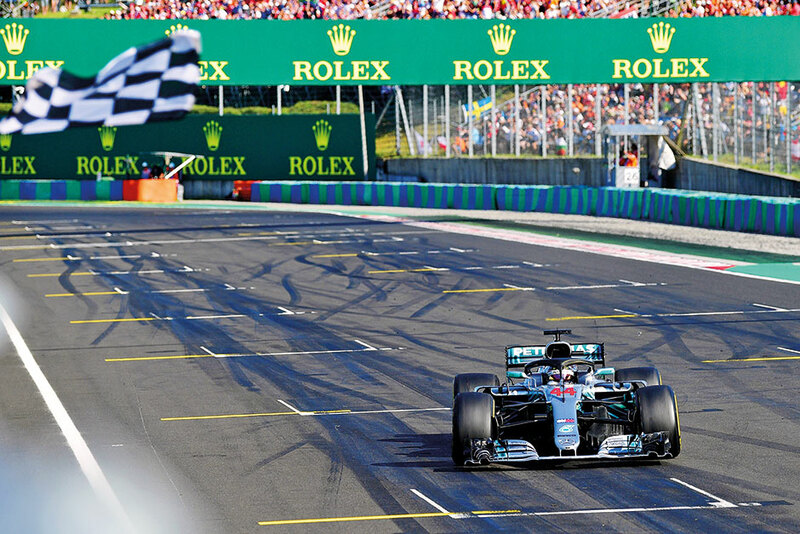 Budapest: Lewis Hamilton strengthened his push for a fifth world title by increasing his championship lead to 24 points on Sunday as he claimed a convincing victory for Mercedes in the Hungarian Grand Prix. That came on lap 65, of the 70, when Vettel finally passed Bottas, the Finn’s right front wing touching his rear left tyre under braking, wrecking Mercedes’ hopes of a one-two finish. Kimi Raikkonen finished third, his fifth podium finish in a row, in the second Ferrari ahead of Daniel Ricciardo, who surged from 12th on the grid to fourth for Red Bull ahead of Bottas, who finished fifth after a late pit stop. It was Hamilton’s record sixth win in Hungary, his fifth this season and the 67th of his career. Hamilton now has 213 points to Vettel’s 189 after the 12th of 21 races this year and before the championship takes a European summer break. “P2 is not what we really wanted, but the maximum we could get today,” said Vettel. The race, preceded by a minute’s silence for former Ferrari boss Sergio Marchionne, began in sweltering conditions with a track temperature of 57 degrees Celsius and air at 34. After Saturday’s rain-lashed qualifying, the teams had a free choice of tyres, which saw Ferrari split their strategy — Vettel, like Sainz, choosing softs, while Raikkonen and the rest started on ultra-softs.